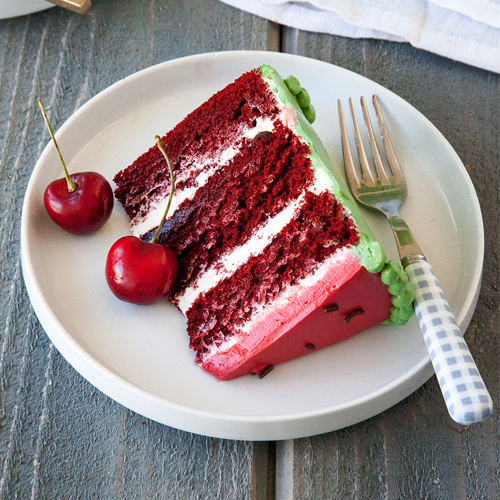 A watermelon cake is a great way to enjoy dessert this summer. Refreshing and delicious. In a large bowl, combine the cake mix, gelatin, water, eggs and oil; beat on low speed for 30 seconds. Beat on medium for 2 minutes. Pour into two greased and floured 9-in. round baking pans. Bake at 350 degree for 30-35 minutes or until a toothpick inserted near the center comes out clean. Cool for 10 minutes before removing from pans to wire racks to cool completely. Set aside 2 tablespoons frosting for decorating. Place 1-1/4 cups frosting in a bowl; tint red. Tint remaining frosting green. Place one cake layer on a serving plate; spread with 1/2 cup red frosting to within 1/4 in. of edges. Top with second cake. Frost top with remaining red frosting to within 3/4 in. of edges. Frost sides and top edge of cake with green frosting. Cut a 1/4-in. hole in the corner of pastry or plastic bag. Fill the bag with reserved white frosting. Pipe around top edge of cake where green and pink frostings meet. For seeds, insert chocolate chips upside down into cake top.